Today was a particularly exciting and engaging day at the Community Park. The day opened with a creative and insightful theatre performance by the Seka and Malambo Dram Group from Zambia, who presented a play called "Nsendemila". SEKA and Malambo Drama Group enthralled the audience with their vibrant theatrical production. Song, dance, storytelling and puppets were woven together in a seamless story that told of a community's perspective on the governance of natural resources and the equitable distribution of benefits. Following this theatre production, the Community Park was host to a gathering of Local and Global Leaders, who had frank and informal discussion as peers, on issues of relevance to people living in association with protected areas. Local and Global leaders were invited by the organisers of the Community Park to share their perspectives in the spirit of collaboration and partnership, as those who are the front lines of sustainable development and those who lead the direction of tremendous know how and resources for this same objective. The rationale for holding this groundbreaking event emerged from experiences with a similar event that was held at the World Summit for Sustainable Development, one year ago, in Johannesburg. 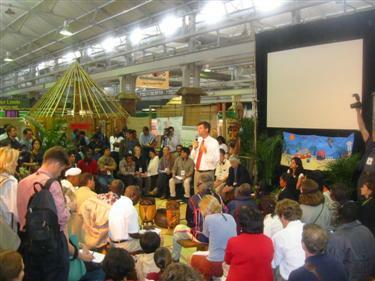 All involved in the Local-Global Leaders' Dialogue in Johannesburg requested a repeat of that experience at the World Parks Congress. Today in Durban, over 50 community representatives and leaders actively engaged in the dialogue. 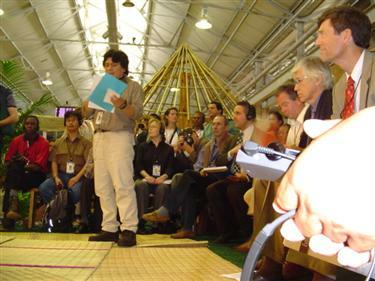 Participants included Indigenous and Mobile Peoples' living in numerous countries around the world. These local leaders were joined by the Leaders of global NGOs. Present were John Croxall, Chairman of the Royal Society for the Protection of Birds, Steve McCormick, President and CEO of The Nature Conservancy, and Russell Mittermeier, President of Conservation International. Achim Steiner, Director General of the International Union of the Conservation of Nature, joined the dialogue as it was underway. This dialogue was also attended by an audience of over 200 people as well as members of the international media. "On the 11 th September, the Community Park area hosted a meeting between Indigenous Peoples' representatives and high level officials in the major international conservation agencies of Conservation International, The Nature Conservancy and the Royal Society for the Protection of Birds. Discussions, as noted by participants on both sides, were a unique opportunity for dialogue and exchange. It became clear in the discussion however that a gulf exists between the expressed intentions of the conservation agencies, and the reality of the experiences shared by Indigenous communities affected by their projects. To address the enormous disparity between the stated values of these agencies, and the reality of Indigenous experiences, a suggestion was forwarded that these agencies develop a policy on Indigenous Peoples. The importance of such a policy in avoiding and mitigating unwanted destructive impacts is demonstrated by the admission of the agency representatives during the discussions that pressure from donors can lead to "quick and dirty" conservation projects. Of greater concern through, is the self-professed desire of the agencies to avoid "digging the dirt of the past". This denial of history strikes at the heart of the key goals of the IP's here at the Congress, for only by recognising and redressing the wrongs of the past can we resolve the sufferings of our brothers and sisters who have lost their access to their lands and territories." Following this Local - Global Leaders' Dialogue, Achim Steiner welcomed a group of community youth who rode bicycles all the way from the Transfrontier Protected Area that spans South Africa, Zimbabwe and Botswana. These youth, from communities located within the Transfrontier Park, rode 990 kms to come to Durban. Along the way, they spoke with their communities and others to gather messages to bring to the World Parks Congress. These messages were conveyed by the youth during a brief ceremony in the Community Park. Certificates of recognition were awarded by the Government of Canada, who provided financial assistance to for this cycle ride. Later in the afternoon, a Community Leader from the Seri Tribe joined the Community Park with a presentation and discussion about natural resource use and culture in his community. This Seri leader lives on Isla Tíburon in the Gulf of California, Mexico. Those present learned about the Seri understanding of the sacred nature of the natural environment, and how the lives of local people are intrinsically interwoven with the fate of the biodiversity tha twe depend upon for the survival of our human species. Mobile Peoples from Morocco next took the floor of the Park, to lead a discussion on their relationship with protected areas in their country. 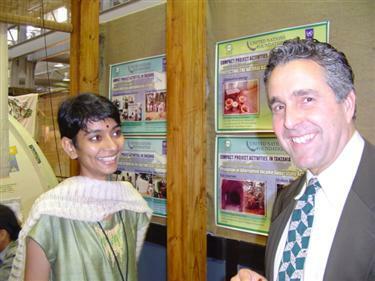 They stressed the importance of sustainable approaches to the use of biodiversity. Also highlighted were a series of challenges and successes that the group has experienced in collaborating with the national government and protected area authorities. Later in the day, the UNDP/GEF Small Grants Program held a presentation and discussion about the support its provides for biodiversity conservation and poverty reduction in six World Heritage Sites around the world. This informative session attracted the participation of a number of conservation practitioners from governmental and non-governmental organisations. The presentation and discussion was followed by a reception at the venue that provided an opportunity for participants to mingle and discuss informally. In the evening, the Indigenous and Mobile Peoples' held a special caucus session at the Community Park, which was attended by over 50 Indigenous and Mobile Peoples' representatives. Progress made during the day was assessed, strategies were developed for the next days' sessions, and opportunities were outlined for ensuring maximal impact on the outcomes of the World Parks Congress.